New offensive coordinator Sterlin Gilbert says "I've always been a Texas fan." Charlie Strong called Shawn Watson and Joe Wickline "good coaches and high-quality people" but felt change was needed. For the past two seasons, the belief was Texas offensive assistants Shawn Watson and Joe Wickline were never in lockstep with each other. Watson, the quarterbacks coach, arrived with designs of installing a West Coast offense. Wickline’s contribution, a zone blocking scheme, was viewed as misfitting to Watson’s plan. Their shotgun marriage, brought together by mutual coaching friend Charlie Strong, came to an end Saturday when Texas delivered news that had long been expected and announced that neither will return in 2016. In their place are two men who might as well be the Bert and Ernie of college football. Offensive coordinator Sterlin Gilbert and line coach Matt Mattox, whose hirings by Texas were made official on Saturday, were together the past three seasons at Eastern Illinois (2013), Bowling Green (2014) and Tulsa (2015). Whether their partnership at Texas lasts beyond next season will depend largely on their ability to correct an offense that burst into flames under their predecessors. The history books will remember Watson most as the guy who was demoted from play-caller after just one game into his second year. Wickline will be the guy who was embroiled in a contentious lawsuit with his previous employer, Oklahoma State, over his play-calling duties at Texas. Texas announced that Gilbert and Mattox each will receive a three-year contract — an unprecedented length for an assistant coach at the school. Gilbert will make $850,000 and Mattox $550,000, figures that are roughly the same as those reported by the American-Statesman on Friday night. Gilbert’s salary would have been tied for the second highest in the Big 12 this season. This is all pending approval of the UT System Board of Regents. Their hirings were not secured until Friday night when a traveling party headed by UT President Gregory L. Fenves flew to Tulsa to convince Gilbert to reconsider an offer he had turned down earlier in the day for less pay. Gilbert was the No. 2 choice after Strong swung and missed at TCU’s Sonny Cumbie, but optimism reined among loyalists because Gilbert will be bringing with him knowledge he’s acquired for many years studying Art Briles’ uptempo spread system. A program spokesman said the hirings go into effect immediately and that Gilbert and Mattox will not return to Tulsa to coach the Golden Hurricane in the Dec. 26 Independence Bowl against Virginia Tech. Their first charge at UT will be to help pull together a recruiting class with 10 or more unfilled spots. 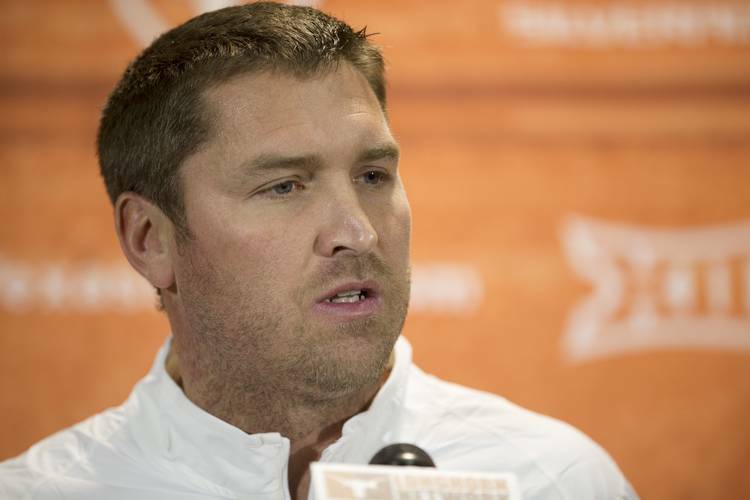 Texas offensive line coach Matt Mattox speaks at his introductory news conference at Royal-Memorial Stadium in Austin, Texas, on Monday December 14, 2015. Mattox, perhaps more so than Gilbert, will have to get moving quickly, as Strong has been direct in his message that the team needs an influx of quality linemen. Gilbert inherits a commitment from the state’s top quarterback, Arlington Lamar’s Shane Buechele, who is visiting campus this weekend on his official visit. Concerns about Buechele’s allegiance to Texas were allayed on Saturday when he tweeted a photo of himself and Longhorns commitments DeMarco Boyd, Collin Johnson and Peyton Aucoin on set at Longhorn Network. Gilbert’s track record of producing quarterbacks over the past few seasons is far better than Texas’. At Tulsa, junior Dane Evans is the nation’s No. 7 passer and needs only 42 yards in the bowl game to reach 4,000. At Bowling Green, Gilbert was forced to play back-up quarterback James Knapke after starter Matt Johnson went down for the season in the first game. Knapke responded with more than 3,000 yards and Bowling Green won the Mid-American Conference East division. Johnson, healthy this year, captured MAC player of the year accolades and the Falcons won the MAC. At Tulsa, Gilbert and Mattox were Co-offensive coordinators, though they both deferred to head coach Philip Montgomery as the primary play-caller. That was the same arrangement they had at Bowling Green when they worked for head coach Dino Babers, who was also their boss at Eastern Illinois. Strong called Watson and Wickline “good coaches and high-quality people” but noted “we’re at a point where we need to look in a different direction in their positions.” Watson made $650,000. Wickline pulled in $575,000, which is less than the $600,000 he’s being sued for by Oklahoma State for allegedly leaving for a job without play-calling duties. Watson and Wickline had just finished the final season on their two-year contracts, as did running backs coach Tommie Robinson who apparently is still working for Texas. A source told the American-Statesman that offensive assistant Jay Norvell, who called plays in the final 11 games, was recruiting on behalf of Texas on Saturday. Norvell has one year left on his deal, but speculation is swirling on whether he’ll be back.